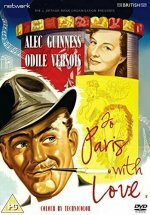 An amiable, light-hearted exercise in postwar naughtiness, with Alec Guinness and Vernon Gray as father and son outdoing each other in smoothness, each planning amorous adventures for the other. The ensuing complications are enlivened by Guinness's engaging performance, reunited as he is with his Kind Hearts and Coronets director Robert Hamer, and a screenplay of sweet charm from Warner Bros veteran Robert Buckner. Both the leading lady, lovely Odile Versois, and Paris itself are delightful in mid-1950s Technicolor, and this movie, though slight, is often shamefully underrated.